Surprise! I made a new episode of that sugary and chill puzzle game, it's sugar, sugar 3 time! You know the deal: draw and get enough sugar in the cups in 30 sweet levels. If you like the game, please take a moment to share it on facebook, twitter or wherever you want. Thanks and enjoy! Well this is a new browser game Alexandre with levels designed for the browser. In the Android play store there's only one 'sugar, sugar' game, but it gets new levels from time to time (levels that work well on mobile). Cheers! In fact I can play on Android. My Tablet have Flash Player installed, and the game opened up and worked well. But on the first level, when sugar enters the cup, that number 100 does not lower to zero. It keeps in 100. Something that you (or I) can do? Thanks for bringing more sugar to our desktops Bart, I love this game! Yay! I have played the previous ones several times! So excited for this one!! I LOVE Sugar, Sugar to the point where I'd play the 1st, 2nd and Xmas one over and over. I even purchased it for both my phone AND Kindle. SOOOO happy there is a new one to play! Keep up the AMAZING work! Wow! Only halfway through, but I'm impressed! Beautiful visuals-- I loved how you toned down some shades and added yellow. And the new features are awesome. Congrats! Love it Thanks Bart! Level 28 is kicking my ___ ! Best one yet. Thanks Bart! Thank you! Wait is over! My favourite game ^_^ yaaaaaaaay thanks for the 3rd episode!! Has anyone gotten level 28? Fantastic game, Bart, sooo relaxing and really enjoyable. I finished all 30 levels and I gotta give it to you - the last three were not easy! Loved it, and am looking forward to Sugar, Sugar 4!! There was no menu option once I finished it, and when I restarted it, it took me back to level one and locked the rest. Was 28 the one with the three filters on the left? If so, this is how I did it. I first filled the white cup in the middle with a line close to the tea pot, and then I let ALL the sugar run to the bottom below the purple filter. Then I inverted and started with the orange on top. It's really all about space, as you don't have that much room to get the sugar to the left, through the appropriate filter, and back to the right for the appropriate cup. Tricky, but doable. I got through all 30! The game is the best part, but I always look forward to the free play level at the end. Not too many things to be creative with in the free play mode. I really like your newest sugar,sugar Bart! I love the color scheme. It is however, making me crave cookies and tea. What a great surprise! Never guessed there's be a three. If the other three were physical games, they'd be wear marks from so many repeat plays. btw, I like the single grain problems. Wow a surprise indeed! Lots of new features to really like, not overly difficult but trick enough to provide good entertainment and a challenge. 10/10. A new factory balls would be amazing (hint hint)!! AWESOME - just what an addict like me needs LOL!! Thanks Bart. Enjoyed all 30 levels. Lot´s of fun. GREAT GAME!!! Why don't you add a fast‐forwarding button? About the question to add a fast-forwarding or speed up button: well, the whole game is build around the fact that it is meant to be chill: the relaxing music, the trickling of the sugar. Adding a speed up button would make this a totally different game. Same goes for adding an erase lines function, would also make it a totally different game. Thanks Bart! Love this new Sugar Sugar - new effects and features are great! Cookies and real looking spoons, what's not to like? I'm really happy to play a new sugar sugar, it's just perfect (gameplay, music, design) excepted the we features : exclusive colour cup ok but combined with those levels in which you have only 4 pixels of sugar... It really gets on my nerves and don't chill or relax me at all, I just ragequit. Awsome and tricky ! Thanks, bart, for this third version, which is as perfect as the previous ones. I know it was good because it took me 4 days to get through to the end. I thought level 28 was the most challenging. Spent a great deal of time when I should have been working trying to figure out something that would work. So much fun to work through the puzzles. And I have turned on other friends to the game as well. Thank you, Bart for Number 3! But just one confusion: many times I mistakingly clicked button with "circled arrow" (reset level) instead of "up-down" button (change gravitaion) because circled arrow made me idea to "turn it over". Maybe is my personal problem of perception? :) In all previous "Sugar, sugar" games reset level button was labelled with text, so there wasn't such a misconception for me. You know, anonymous, that happened to me, too! I just thought it was me! Merci Bart pour cette nouvelle création. Mais j'ai un problème, la flèche de ma souris disparait dans la fenêtre du jeu. :-( Sous Safari comme sous Firefox. Je suis sur un Macbook pro. Je n'ai pas ce problème avec les autres sugar sugar. Encore mille merci pour tous les jeux que vous avez créé et qui m'ont apporté beaucoup de plaisir. Thanks for reporting the disappearing mouse pointer problem! There seems to be a problem with some of the recent ads that are being served before the game starts. When you enter in the ad area with the mouse, it changes into an axe and after that the pointer is gone. I will report this to the ad company. In the meantime, try not to hover over the ad: make sure your mouse pointer is below the game, and when it is fully loaded click on play. yes, same disappearing mouse pointer here, too! I tried to stay in a safe zone while the game charges, but nothing changes: the pointer disappears when I hover the game. Ok, I solved it (the disappearing mouse pointer problem): I clicked on the add, then I closed the game window and clicked again on Sugar,sugar3 to charge again the game. On the second or third attempt, everything was back to normal: a world full of beautiful slow falling relaxing sugar. I've been told the dispappearing mouse pointer with the ads is solved. Should you get the problem again, just refresh the game page so you'll get another one, and tell me please, thanks! Game works fine for me. I really enjoy this series and am so glad to see a new one. The sugar of the future is a good addition and I really like the new decor that you added to this one. Thanks so much Bart for making this! Thank you Bart ! For solving this problem. Love the game! So fun!!! Hi there, love the game but feel it is too easy would really love some very difficult levels where you need to get it spot on to make it work. Most levels even top levels have far to many sugar cubes which mean you can make mistakes and still have enough to get through. I was really happy to see you have made Sugar, Sugar 3. It made my day, and I have been playing it for almost 5 hours straight for the first day, and played it again next day. 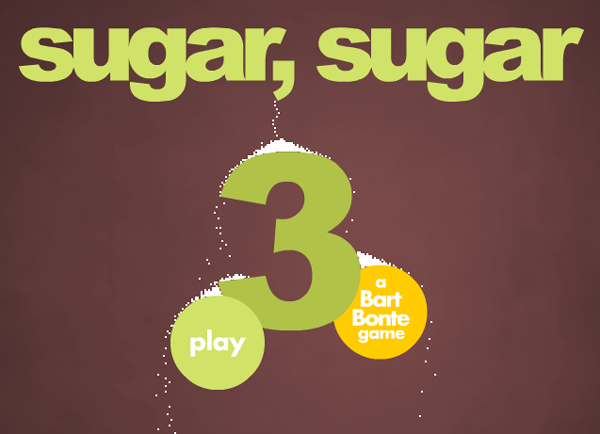 I really enjoyed it, in fact I consider Sugar, Sugar series one of the best flash games ever made. walkthrough videos, I just couldn't manage to draw lines in a way to solve that level. It wasn't about thinking how to solve it, it came down to lack of my ability to draw lines in a way to solve it, and I was disappointed for not being able to enjoy last two levels of a game. Maybe you should include skip button for levels that are just too hard to pass. Also, please make more of this kind of games, maybe instead of sugar you can make new series with all kind of different materials (glitter would be cool :)). Thanks for the new instalment Bart. I sent you a list of wish-list ideas a long time ago, can't remember if the 'pure' cups were one of them, but keep going! Hey, i just wanna know what are exclusive cups! thanks! now i know what are exclusive cups. I'll use those instructions (Exclusive cups: they only accept the sugar color of the cup. When another color enters the cup, the level restarts...) to help me on the next time I play sugar, sugar 3. Why are there no red cups in Sugar Sugar 3? Amazing game, Bonte! I really like your work. Could you perhaps tell me who created the game music? I just beat Level 18 without hitting the gravity button. I feel so accomplished, haha. Thank you Bart for making games that are still fun to replay years later!